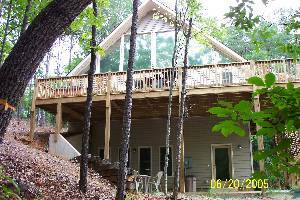 In the Blue Ridge Mountains of N. Ga., in a peacefull and quiet area close to many outdoor activities. Sparkling clean accomodations that are fully furnished and equipped to make your stay enjoyable. Book your Hiawassee Georgia directly with the owner or manager and save hundreds or even thousands over hotels, and enjoy the comforts of a home away from home. FindVacationRentals.com offers thousands of in Hiawassee Georgia in the most sought after travel destinations. Interested in More Hiawassee, Georgia ? Check out nearby Blairsville, Helen , Highlands , Lake Nantahala, Murphy, Nantahala , Robbinsville.